Chocolate fudge cupcakes with a secret inside. Topped with a peanut butter-flavored frosting, these special cupcakes are sure to be a hit with both young and old. Prepare the cake mix according to the directions on the package. Line cupcake tins with paper liners and pour batter in cups, filling approximately 3/4 full. If using chocolate kisses, remove foil from the kisses and place one in the center of each cupcake. Press down in batter until almost completely covered. If using peanut butter chips, stir into batter before filling the cups. Remove from the oven when done and cool for 10 minutes before removing from pans to wire rack to cool completely. For Peanut Butter Frosting, beat cocoa into peanut butter and butter. Gradually add powdered sugar and milk. Add vanilla and additional milk if needed. Frost cooled cupcakes. 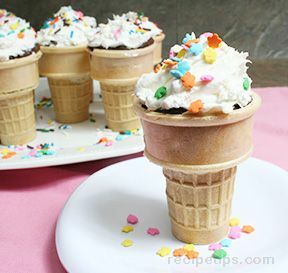 If desired, decorate the top of the cupcakes with sprinkles, mini chocolate chips, or decoration of choice. 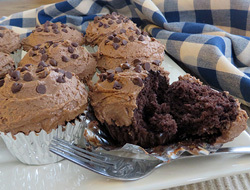 "These chocolate fudge cupcakes were great with the peanut butter chips added. 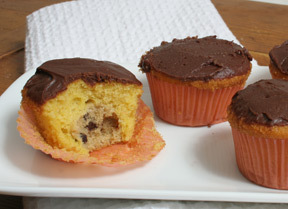 The peanut butter fudge-flavored frosting made a perfect topping for these cupcakes. 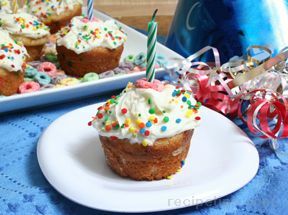 These cupcakes were a big hit with the grandkids."